This is one more recipe from my grandmom. Her GavhaachI Kheer' and 'PaaTavaDyaa' were like heaven. She used to make these paatvadya so quickly. My mom and one of my aunt make them well too but granmom's is the one I loved the most. Sometimes she did not have enough things but still the taste was always same, never grain of salt more or less. Whenever I remember the food she prepared I get very nostalgic. I learned lot of things from her but there were still things that I could have learned. That's life though! This is her recipe except amount of oil she used to put. I couldn't even push myself to use that much oil. I use almost 1/4 of oil she used to put. Sift Besan and set aside. Heat oil in a thick bottom vessel. Add cumin seeds, mustard seeds, turmeric and curry leaves. Let it sizzle for a minute. Now add half of the shredded coconut. Fry this gently without burning it. Now add water and let it boil. Once water starts boiling add salt, chili powder, and little bit of cilantro. Lower the flame and add besan (chick pea flour), don't let besan to form lumps. Stir constantly. After you add all besan the consistency should be very thick and dry like 'zunaka'. If you think its bit thinner , add more besan (about 2-3 table spoons should be enough). Let it cook on lower flame by covering the vessel. Add 2 tablespoons of oil around the cooked besan, mix it well. Oil a small plate and sprinkle some cilantro and dried coconut on the plate. Add cooked besan in it and spread with back of a stainless steel bowl. You can oil the steel bowl to help spread the dough. now sprinkle rest of cilantro and shredded coconut on top and press it in the dough. Cut the 1"x1" pieces and let it cool. Separate the pieces once its cool. Enjoy warm or at room temperature. 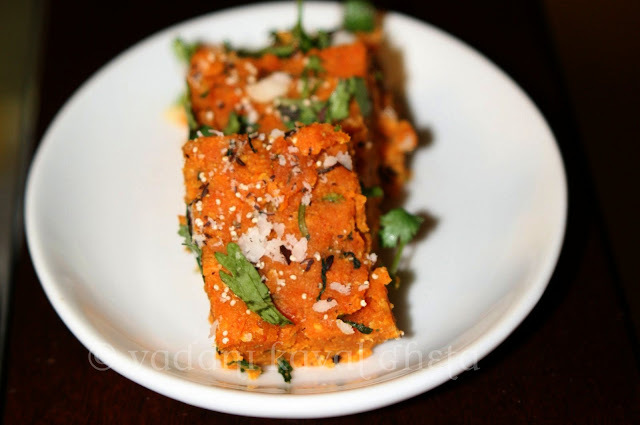 These vadis are supposed to be spicy but use chilli powder per your taste. I usually serve these as appetizer. Nice recipe. My mother would make it frequently when I was young. You have not included garlic and poppy seeds anywhere in recipe, but are part of ingredients.